New design for the ‘The Yard House’ (by Jonathan Tuckey Design). The stunning property was featured on Channel 4’s Grand Designs and has translucent Rodeca polycarbonate panels for walls. The courtyard garden features staggered concrete paving disappearing into Japanese woodland inspired banks of planting. Tom’s first foray into writing in issue #8 of Rakes Progress magazine. 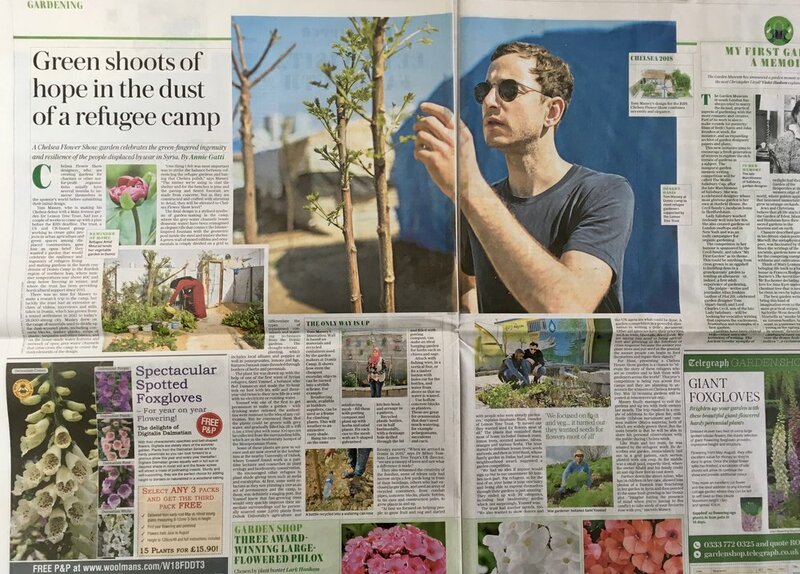 ‘Seeds of Hope’ documents his trip to Domiz camp with Lemon Tree Trust in preparation for the Lemon Tree Trust garden the RHS Chelsea Flower Show. Photographs by Dirk Jan Visser. 'Precious Land' is a show garden that appeared at the 2018 Singapore Garden Festival, a biennial event where top designers from around the world are invited to participate. Over 400,000 visitors attended the show held in the world famous 'Gardens By The Bay'. The garden was in the 'Fantasy Garden' category, where the exhibits are displayed inside a blacked out tent. The garden was awarded a gold medal and an additional prize for the best indoor lighting design. More details on the garden are available here. This video was made for the RHS Chelsea Flower Show press launch, held at M&G investments on the 17th January 2018. Hear designer Tom Massey speak about his main avenue show garden designed for the Lemon Tree Trust, inspired by the resilience and determination of people in situations of forced migration and displacement. A garden inspired by the resilience, determination and ingenuity of refugees living in Domiz camp in Northern Iraq will be unveiled at the 2018 RHS Chelsea Flower Show. The Lemon Tree Trust Garden highlights the importance of gardens and gardening to the thousands of displaced people trying to rebuild their lives. The Lemon Tree Trust supports the development of urban agriculture and greening innovation for refugees and displaced people, promoting food production, well-being and community. Massey’s design draws on elements found in the gardens of refugees displaced within Domiz camp and other refugee settlements across Northern Iraq. People need a way to bring order to a chaotic situation, as well as a space to come together as a community and to learn about horticulture and water retention. Beautiful, drought tolerant planting educates visitors about the type of plants and crops refugees grow on their own plots. Ingenious vertical planting techniques, inspired by refugees’ use of everyday objects, and designed with their input, showcase ideas for planting in limited spaces. Trees laden with fruit, including figs, lemons and pomegranates, provide scent and valuable crops to harvest and trade. Brutal, harsh materials, such as concrete and steel, widely available in the camps, are made beautiful with techniques such as polishing, casting and crafting into patterns and intricate Islamic inspired designs. Colourful and textural planting softens the hard materials. Cooling and calming water flows throughout the space, which is collected in channels and pools, recycled and pumped back through the brimming central Islamic inspired fountain, representing the importance of grey water reuse in the camps and the many makeshift fountains refuges have built in their own gardens. Memories of Summer in this month's ProLandscaper magazine - colourful perennials and blazing sunshine with a designer plants feature on the Perennial Sanctuary Garden which appeared at RHS Hampton Court Palace Flower Show in July. We recently completed the re-design of a private garden for children with cancer at Kingston Hospital. Instead of ripping everything out, we re-used the existing structure, installing a new ‘Secret Garden’, hidden away in the corner of an internal courtyard. We installed new decking and replaced the old and tired canvass screen with a bespoke western red cedar trellis. A huge sail shade was replaced with a multi-stemmed Amelanchier lamarckii tree and the struggling planting was also replaced with a fresh new planting scheme. Visitors will find now find a welcoming oasis of vibrant green garden. We hope that the new Secret Garden space will provide a peaceful and private retreat for the parents and children supported by Momentum. This project was supported by The Generations Foundation and Momentum. "This has been a fantastic and rewarding project to work on, it has been a pleasure to collaborate with the passionate and dedicated Momentum team to create a new garden space for the patients of the children’s oncology ward at Kingston Hospital. I hope the garden will provide some respite and a peaceful place to escape the stressful hospital environment for the children and their families in incredibly difficult times." The Perennial Sanctuary Garden at this summer’s RHS Hampton Court Palace Flower Show will raise awareness of the only charity dedicated to supporting everyone in the horticulture industry. Designed by Tom Massey, who won an RHS Gold Medal and ‘Best Conceptual Garden’ at Hampton Court last year with his first ever show garden, it is part of a new category at the show - ‘Gardens for a Changing World’. The design takes a spiral form, with a changing colour palette of plants to symbolically represent the journey a Perennial client makes as they overcome difficulty with Perennial’s help. People turn to Perennial for financial and emotional help when they are faced by challenges such as illness, injury, poverty, debt and old age and many describe the help Perennial offers simply as a ‘lifeline’. The spiral shape of the garden is planted with a rich mix of plants. At its outer edge the vibrant red colours represent the inner chaos that can come from being at crisis point. As the visitor takes the journey into the garden following a winding gravel path, sounds from outside of the garden fade. The planting becomes taller and more immersive and the colour scheme moves through stimulating yellows and oranges to more restful purples, blues and finally pure green. Towards the centre of the design the planting is simplified, leading to a calm sanctuary at the centre of the garden with bespoke York stone benches and a large reflective water bowl. Here the planting changes to a single species of towering bamboo that screens the outside world, creating a safe haven and place for peaceful reflection hidden from view. In an article in 'Private View' magazine, estate agent Knight Frank have singled me out as one of a new crop of young British garden designers cultivating a flourishing reputation in both the UK and abroad. Read the article here. Martyn Andrews of RT News investigates the growing trend of designers using horticulture to give political messages - included in the piece is a feature on the 'Border Control' garden. Our sponsor UNHCR have produced a video on the award winning ‘Border Control’ garden I designed in collaboration with John Ward at RHS Hampton Court this Summer. I am delighted to announce that the UNHCR 'Border Control' Garden, designed in collaboration with John Ward, has been awarded an RHS Gold Medal and the prestigious 'Best in Show' award in the Conceptual Garden category at RHS Hampton Court Flower Show 2016.